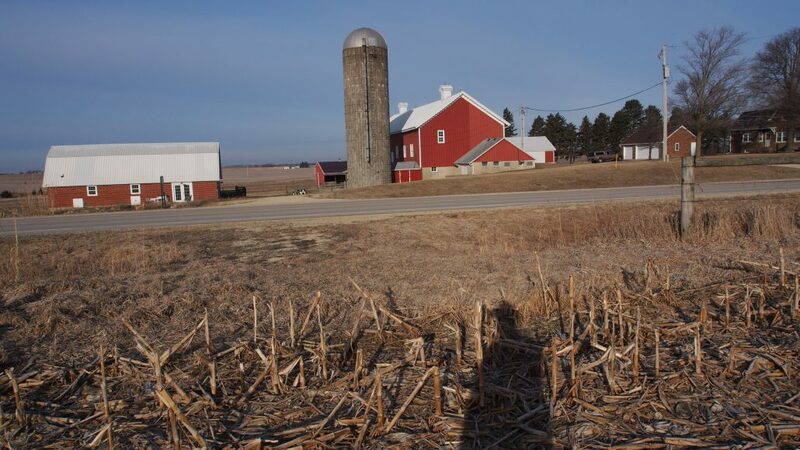 Iowa is a state I’ve never visited and not much came to mind in anticipation except endless stretches of farmland, desolate, windy, and barren in the winter, not unlike my native Ohio. What I didn’t anticipate was the warmth and humanity of the people I would encounter there. 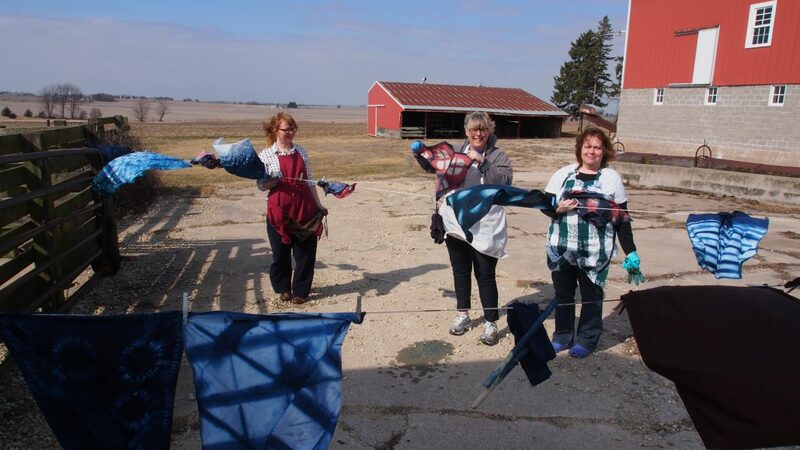 An invitation to give a workshop at Three Pines Farm nearby Cedar Falls/Waterloo area changed my thinking. 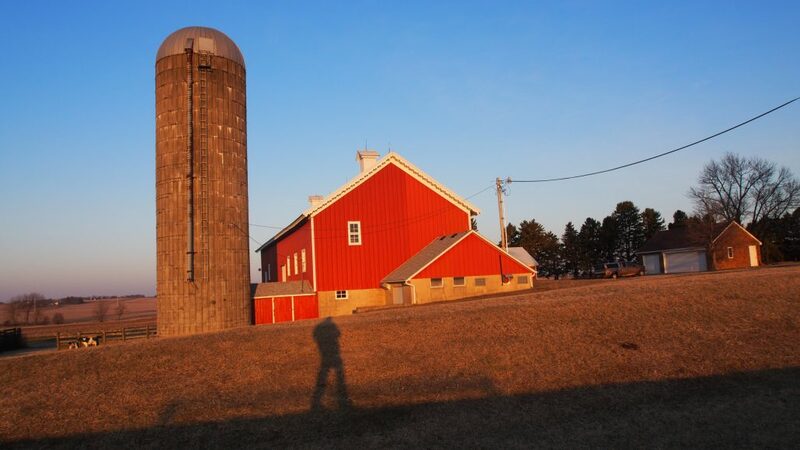 Kara Grupp is the fifth generation to occupy this farm, and she has given a new meaning to the word cultivation. 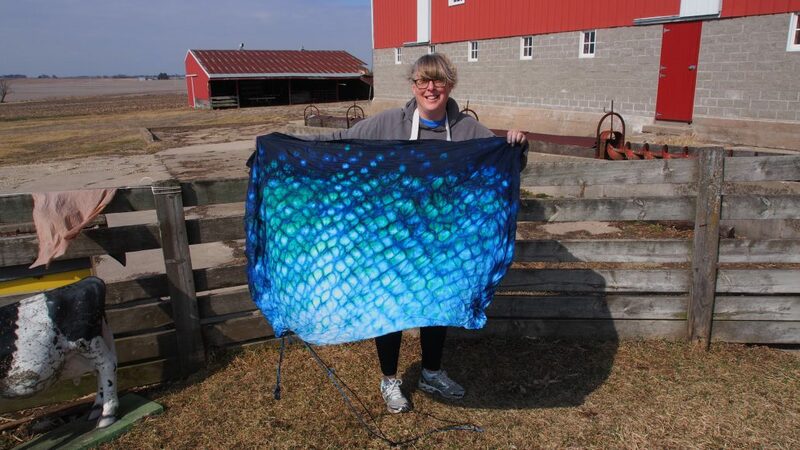 After a successful career in scientific research at the University of Iowa, she found a new calling stirring in her farming roots. 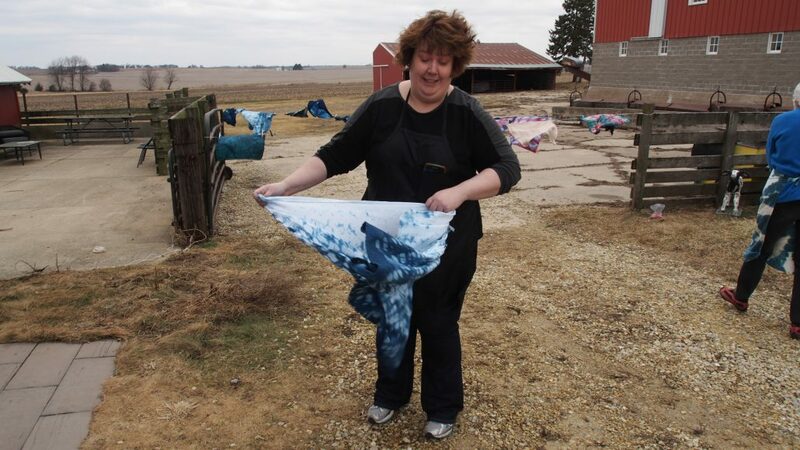 She and her husband decided to return to the farm her family has worked for more than 160 years. 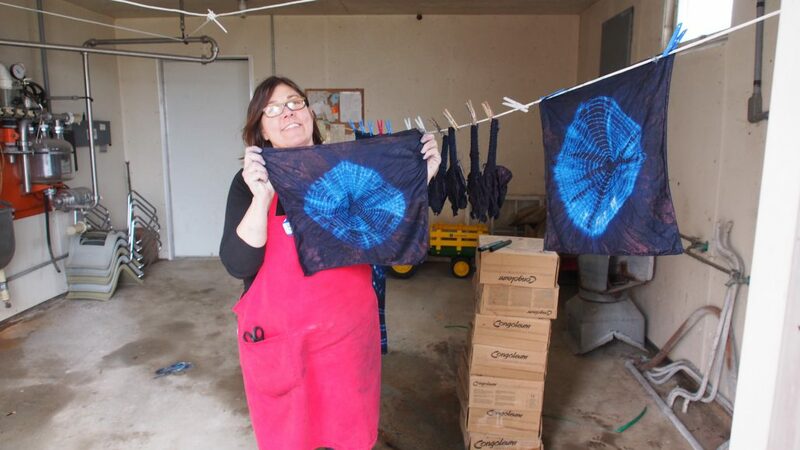 But instead of working the soil, she has chosen a different area to cultivate: community. 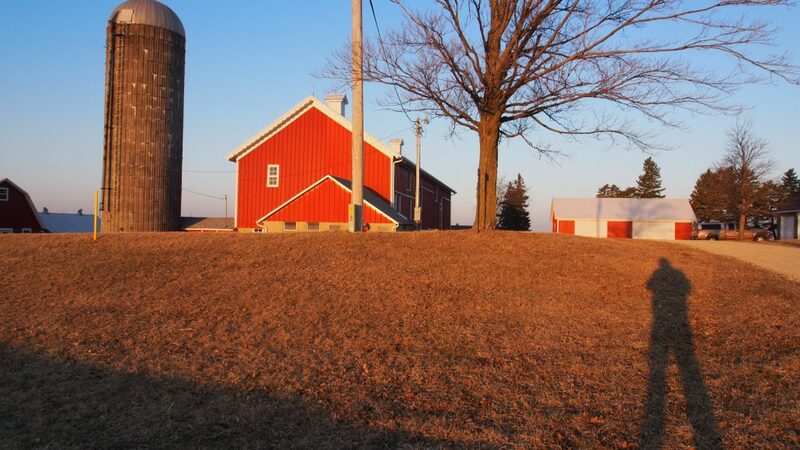 She took her retirement savings and invested it in restoring and transforming the pig barn into a center for bringing together community: Three Pines Farm. 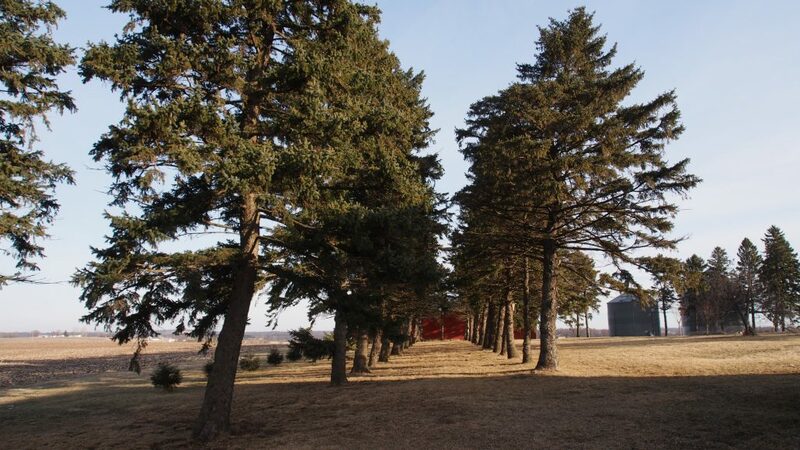 The name comes from the three pines planted in front of the farm house by her ancestors. 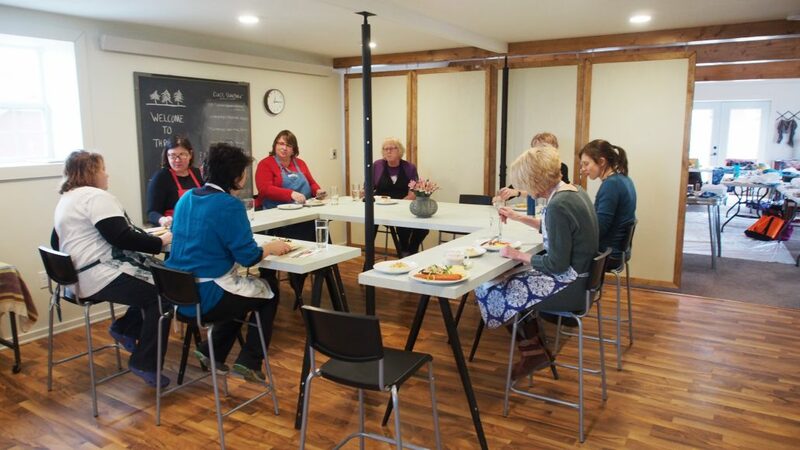 She saw the need for a place where people could come together and share their rich culture through locally produced food, cooking classes, community dinners serving seasonal produce. 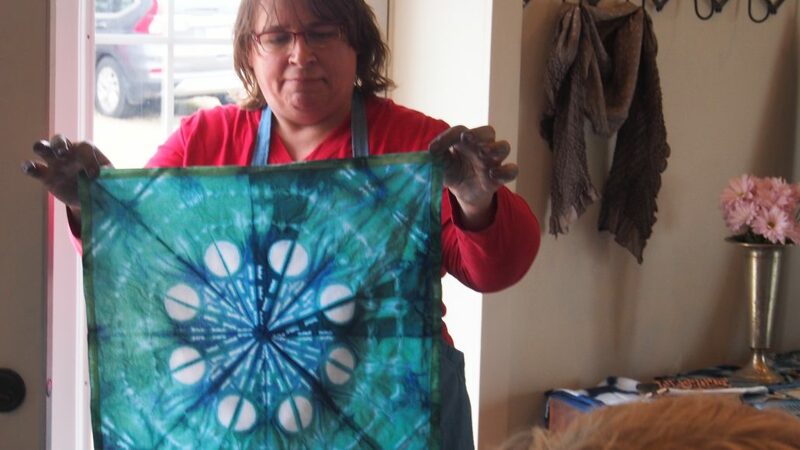 She created a space where local and guest artisans can come and teach their craft. It’s a place where connections to be made, common ground can be found, and lasting friendships are built. 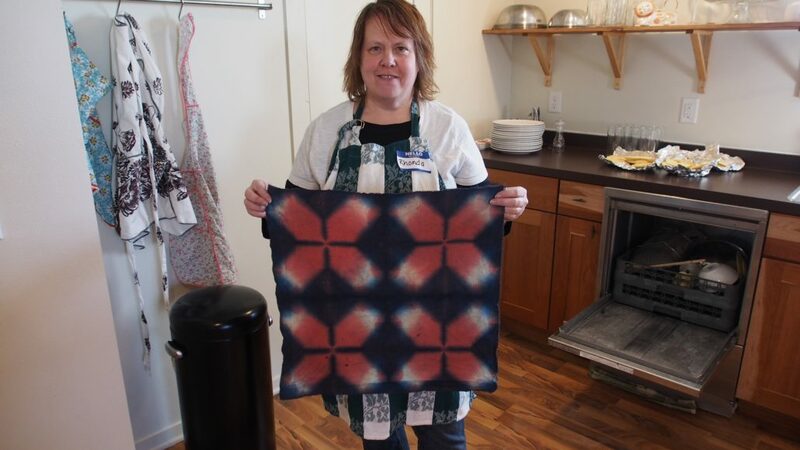 Kara invited me to do a shibori workshop. 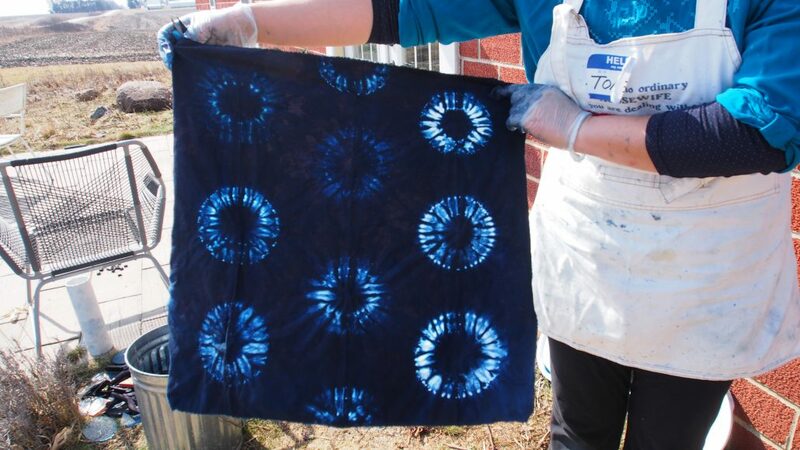 Shibori is the Japanese term for the dye resist technique of binding, tying, folding, clamping, or stitching cloth so that parts of it do not take up the dye. It can produce very structured design while at the same time produce unexpected and amazing results. 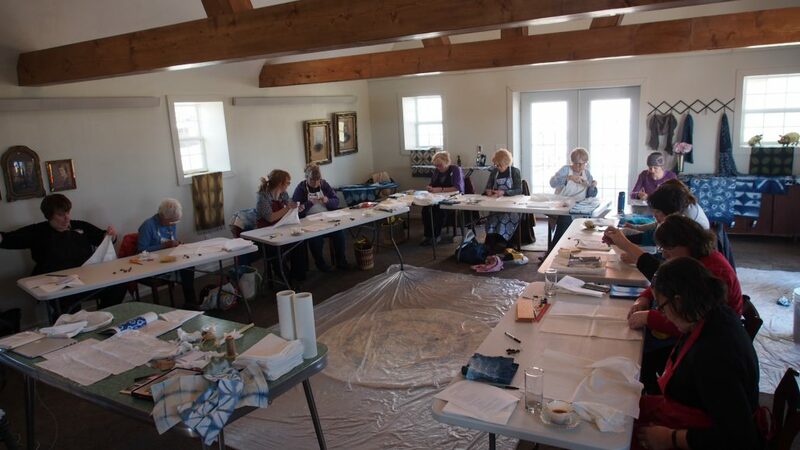 I didn’t expect that the twelve women who arrived on day one of the workshop would be very experienced. I was pleasantly surprised. 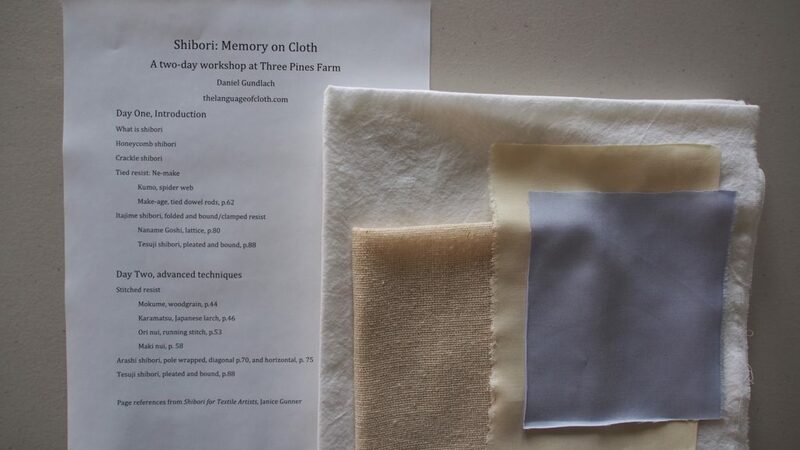 I had prepared a syllabus that could be presented over the course of the two-day workshop. 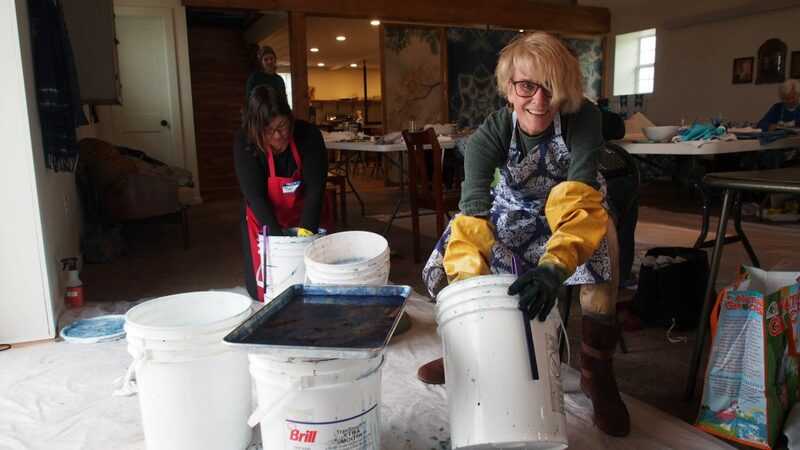 As it turned out the participants were so enthusiastic and talented, we got through eight techniques, producing samples of each in the first day! A few people had some experience already but for most it was the first time. There was a beautiful atmosphere of wonderment and sharing among the group as the results of the experiments were revealed. 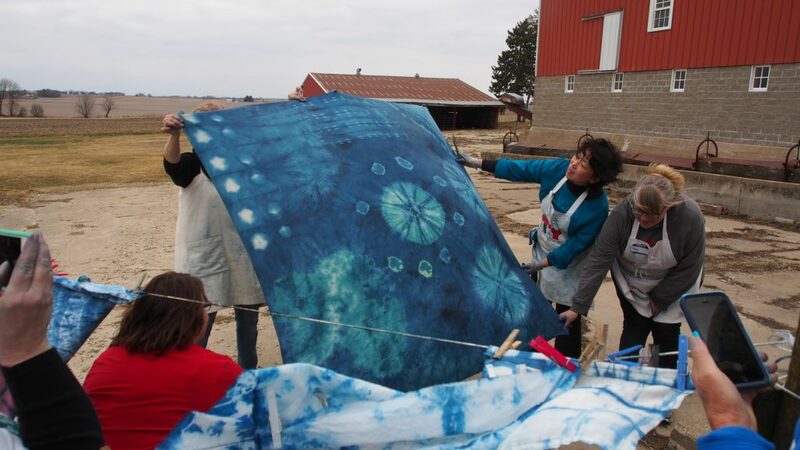 Participants had been encouraged to bring some of their own cloth, to be repurposed or “up-cycled”, given a new life with shibori techniques. 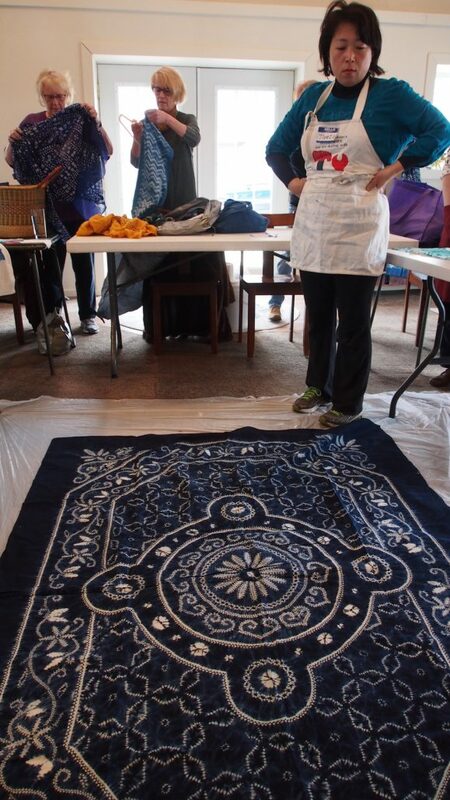 This is a table cover found in a thrift store, on which Tomei applied as many newly learned techniques as she could. 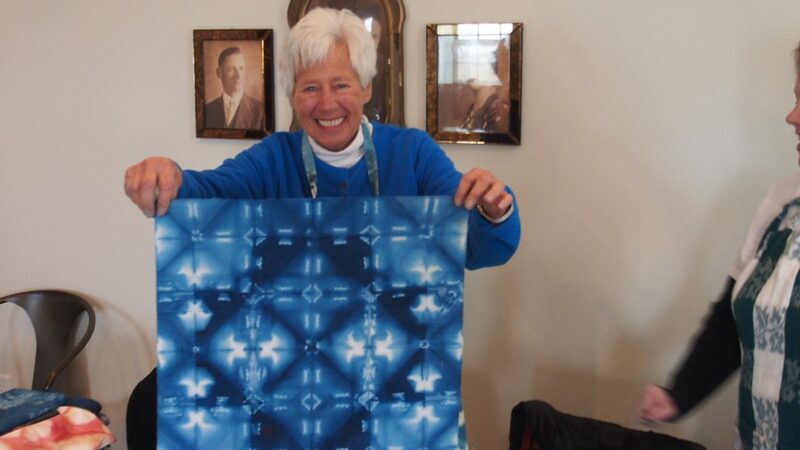 Margaret shows off the marvelous and entirely unexpected results she achieved by using office paper clamps on this sample. Behind her on the wall are old photos of the ancestors of kara who worked the farm in the past. 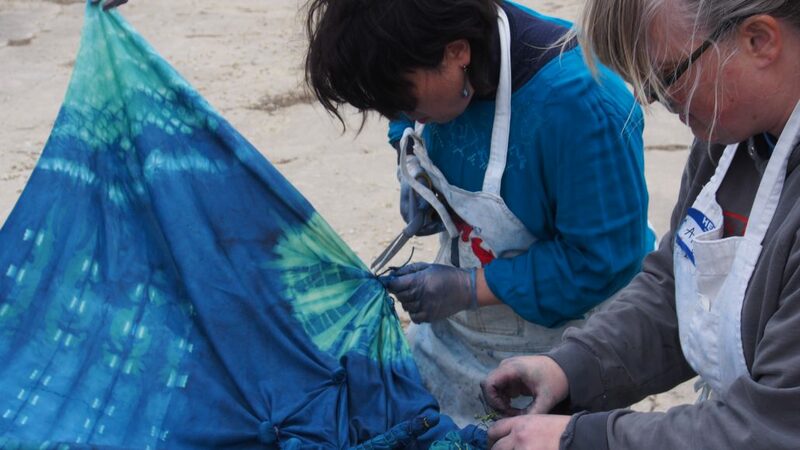 Remembering how you folded the cloth in itajime (folded and clamped) shibori can be a bit difficult. 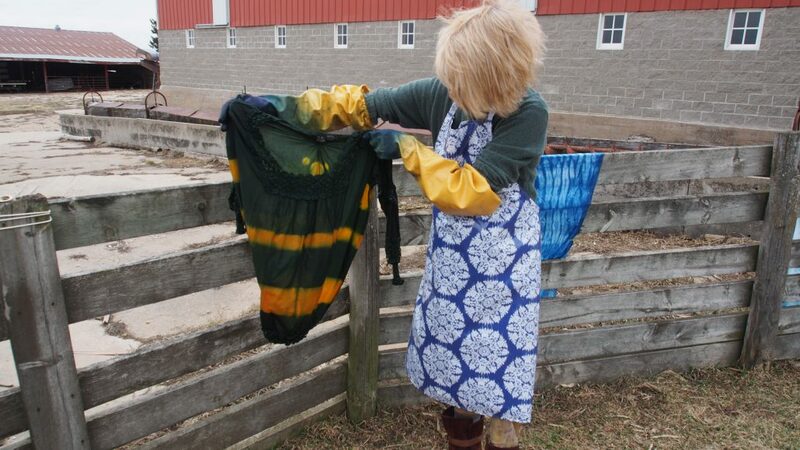 The milkhouse, used years ago for dairy cows, will make a great dye house in the future. 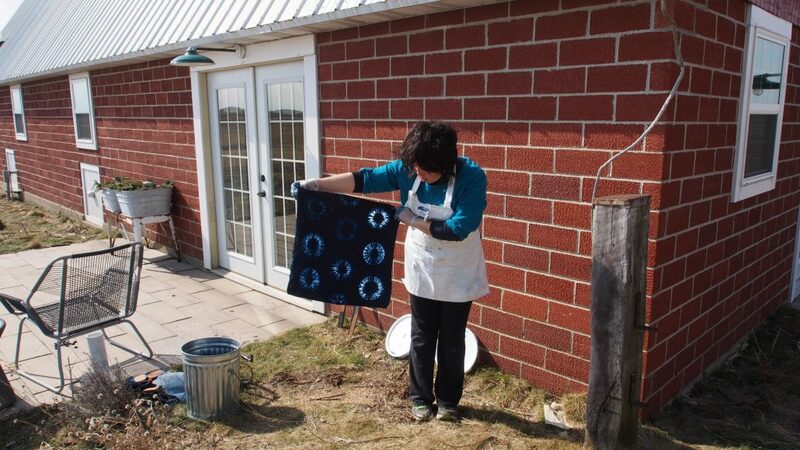 Barb is showing off her set of eight linen napkins upcycled with Kumo ne-make shibori, “spiderweb”, and indigo. 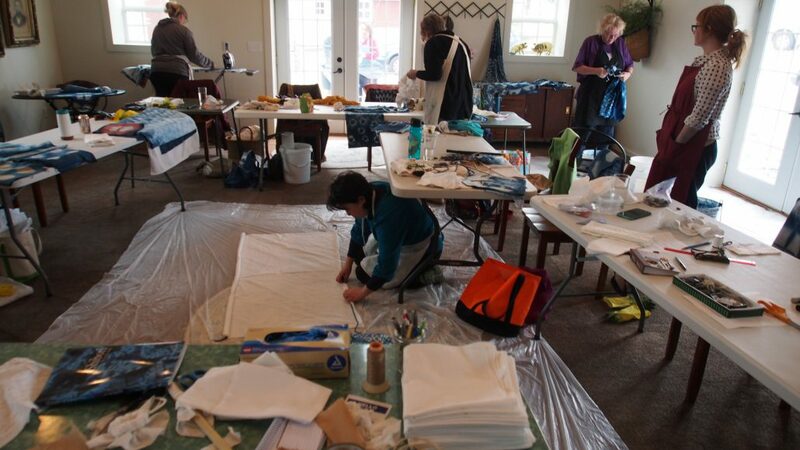 Day two of the workshop, and the creativity and fearless exploration was overwhelming. Beki introduced me to veterinarian gloves. It didn’t take much imagination to think about what they are used for, but they certainly are a welcome improvement on the short, too small gloves I am used to. She chose to over dye a kutch dyed cotton top with indigo after stitching and clamping with some newly acquired skills and achieved this rich dark green color. Lunch was a deliciously welcome break to get to know people better and enjoyed the marvelous culinary skills of our host Kara. I abandoned my initial plan because we accomplished all the techniques in the first day. 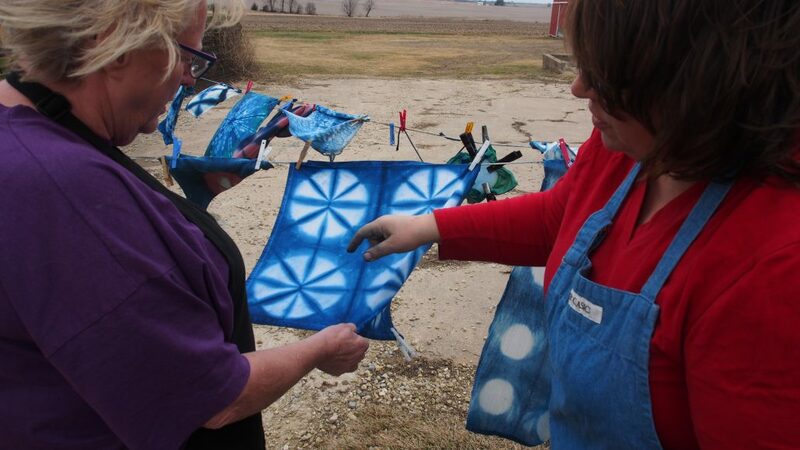 For many participants it was the first time to dye with indigo, and watching the green turn to blue was especially thrilling. 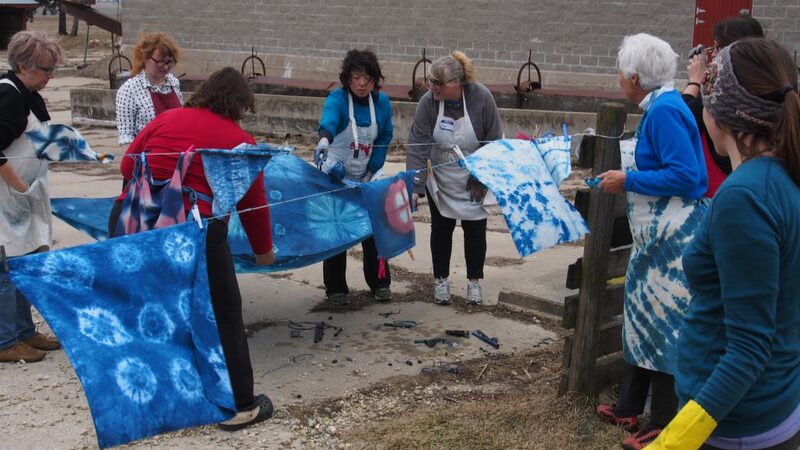 The Iowa wind added a lot of drama to our clothesline. Folded and stitched design, “karamatsu” or larch. 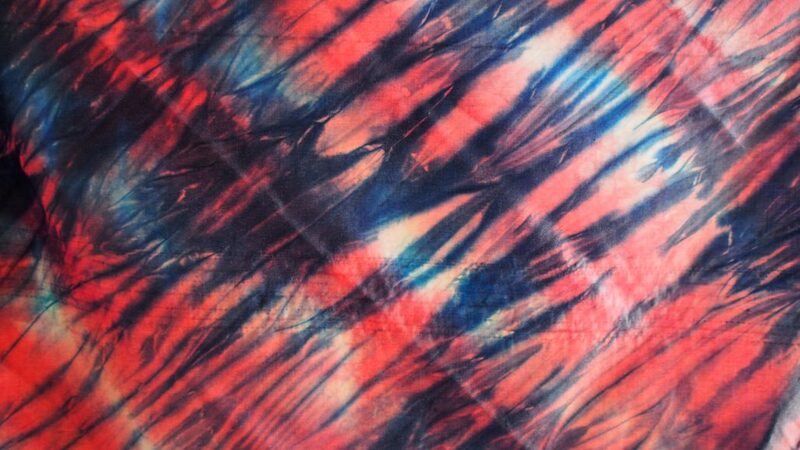 A two process pleated and bound shibori (tesuji) colored with indigo and brazilwood. 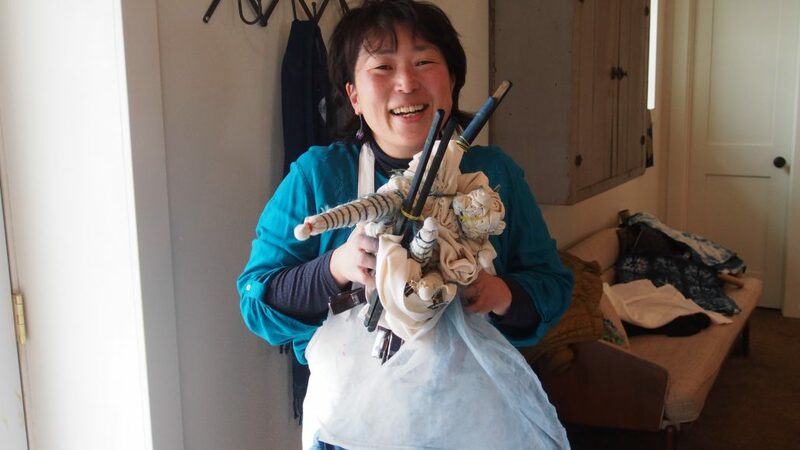 A two process itajime clamped shibori. 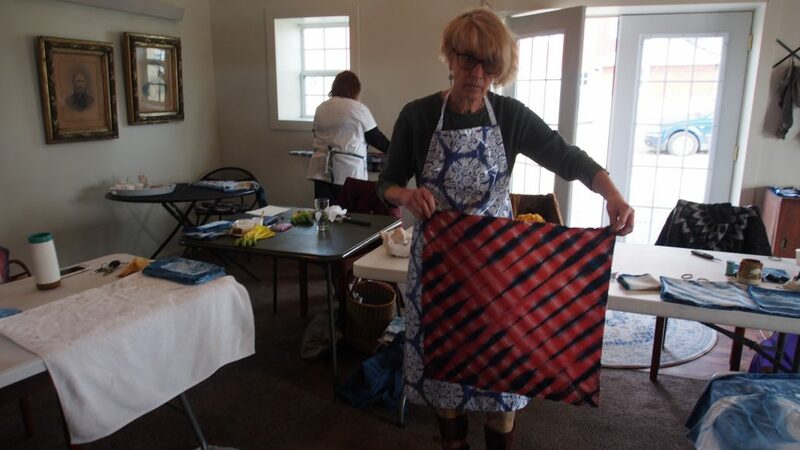 Some participants brought extraordinary pieces of shibori art acquired in their travels to share with the other participants. I will never forget this place and the people who call this home. It is very special. 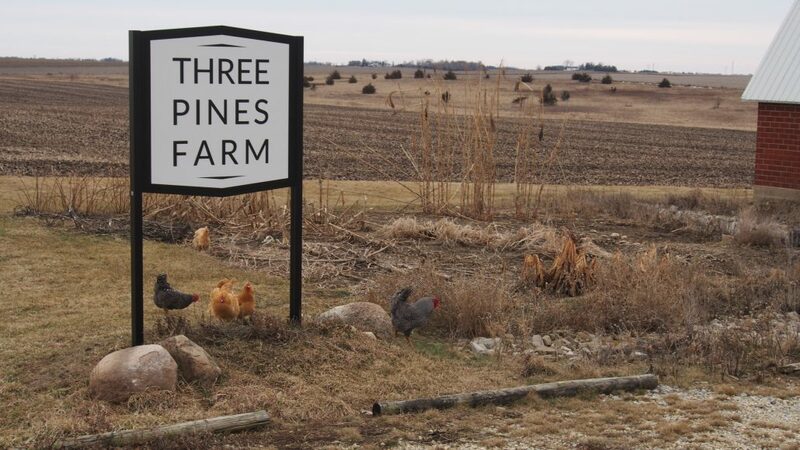 Community is an especially valuable crop to be cultivating in these times, and Three Pines Farm is as fertile as ever. 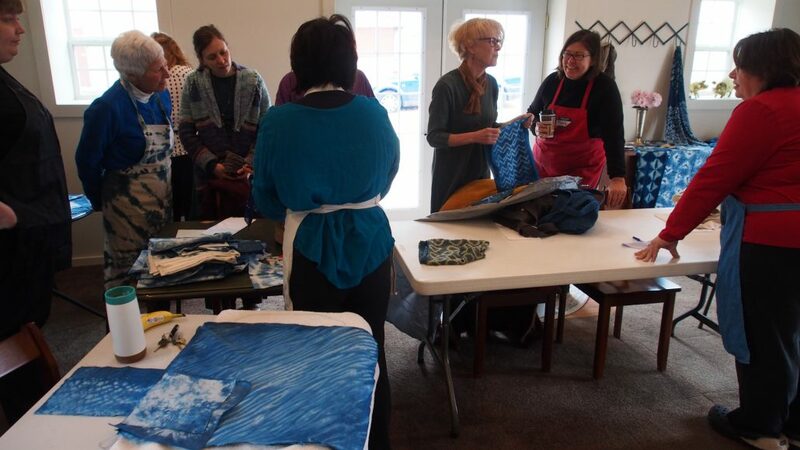 Kara Grupp and the twelve talented women who participated in this workshop have my deepest respect and admiration.